At Circle F Farms we understand the importance of a good herd sire and the impact that he can have on our program. Our herd sires are selected based on how their offspring should meet the needs of our customers and the essential 3 P’s: Pedigree, Phenotype & Performance. It is imperative that the sires that we use produce offspring that are above average for the economically relevant traits of birth weight, growth, milk, carcass, and disposition. In addition, it is important that the offspring of these sires have the right functional build being structurally sound, moderate framed, deep ribbed, and heavy muscled. 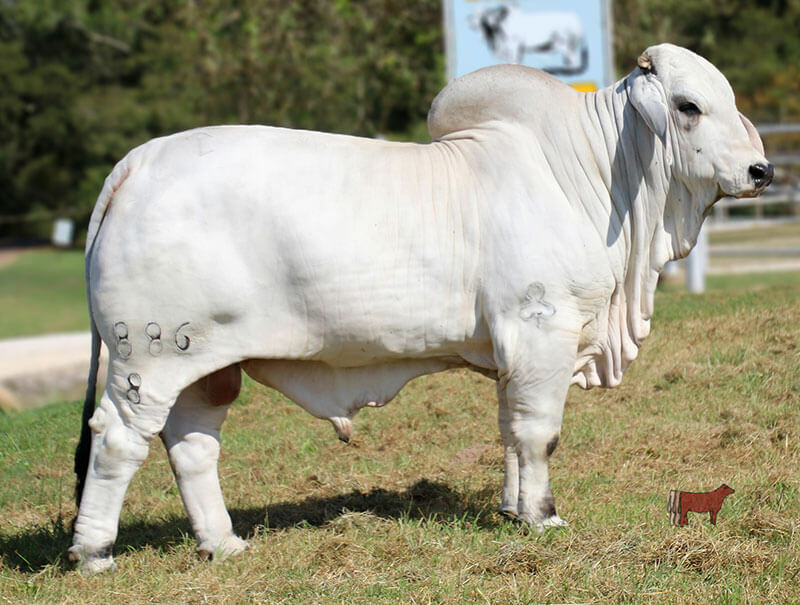 Lastly, our herd sires must be backed by a pedigree consisting of the most proven and influential animals in the Brahman breed to increase the predictability and marketability of their offspring. When you buy cattle from Circle F Farms you can be guaranteed they are sired by a proven breed leader! We were extremely fortunate to have been able to secure this proven herd sire from V8 Ranch to serve as the anchor for our elite program. When viewing the pedigree of Mr. V8 140/7 you quickly recognize that he is a full brother to the 2016 National Champion Female, Miss V8 293/8. They are sired by the breed icon, +Mr. V8 380/6 who has sired cattle that perform in the show ring and in the pasture. 380/6 is most widely recognized as being the #1 Sire of Champions from 2011-2016 including the 2016 International Champion Red & Grey Females, the 2016 ABBA Red & Grey Show Cows of the Year and the 2016 National & 2017 International Champion Females. In addition, his dam +Miss V8 805/6 represents of one of the most influential cow families at V8 Ranch. Not only is 805/6 a former member of the V8 Ranch Showstring but also the dam to the 2016 National Champion and Reserve Calf Champion Females. We at Circle F Farms realize that the show ring is an important promotional arm of the breed but we are in the BEEF business and this is where Mr. V8 140/7 really fits us best. He was the sire of the Overall High Indexing Steer in the 2016 ABBA Carcass Evaluation Program that was nominated by V8 Ranch. This proven producing ability is documented in his performance profile ranking in the top 10% of the breed for 8 growth & carcass traits and reaching the level of a Ribeye Area Trait Leader. We look forward to the impact Mr. V8 140/7 will continue to play in our program. 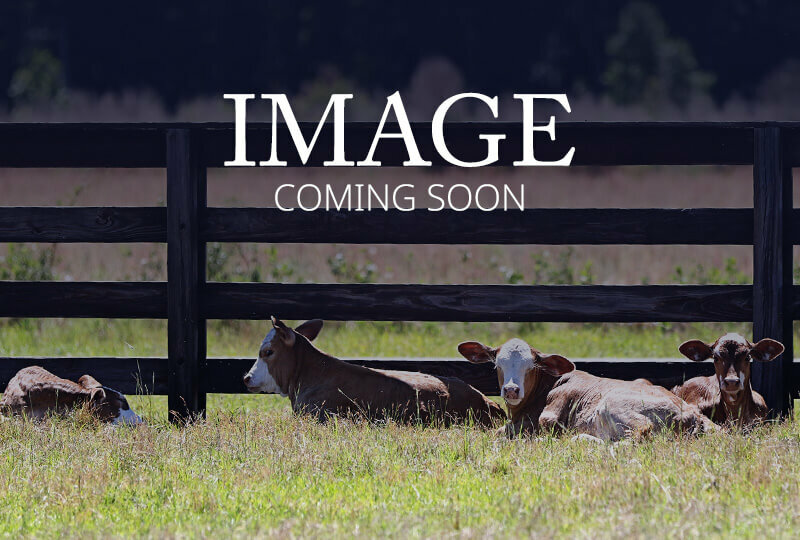 This young herd sire combines some of the most proven and sought after genetics of J.D. Hudgins, Inc. 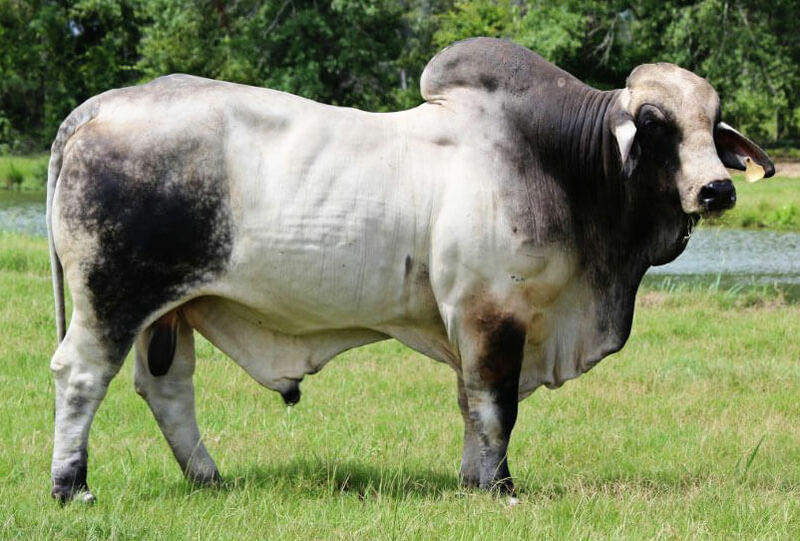 He is sired by one of the most influential sires in the Brahman breed, +JDH Sir Lawford Manso 616/6 who has sired over 500 registered progeny in ABBA and can be found in the pedigrees of over 20 of the leading herd sires on the J.D. Hudgins Ranch. To compliment the globally recognizable top side of JDH Cole Manso’s pedigree is his dam, =JDH Lady Luisa Manso who calved at 34 months of age, had a natural calf each year for six years all culminating into her being named a Maternal Merit Cow. JDH Cole Manso 523/8 not only boasts a breed leading pedigree but also charts better than breed average for 9 traits further proving his sire power and complementarity to our herd. This top sire combines the show ring appeal of his sire, the production of his dam, a globally recognizable pedigree and breed leading performance. The sire to 462/8 is the International & National Champion and Register of Renown, +JDH Woodson De Manso 206/7. Woodson has been one of the most influential sires for J.D. Hudgins producing 8 Grand or Reserve Grand Champions at the International & National Show. In addition, he is the sire of 12 leading herd sires being utilized by J.D. Hudgins as well as a number of other breeders around the world. To further enhance the proven pedigree of 462/8 and to add some practicality is his dam =JDH Willette Manso who calved before her third birthday and had a natural calf each year helping to achieve her the status of a Maternal Merit Award Cow. 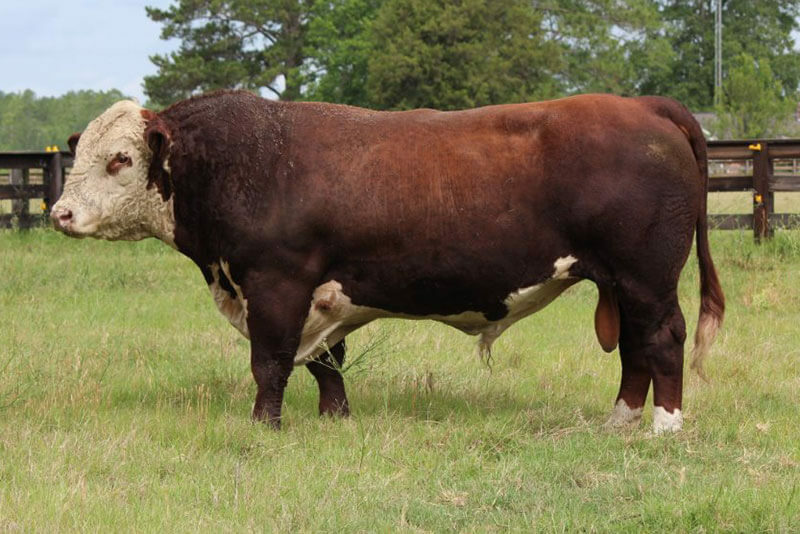 To further validate her production she produced, JDH Manford De Manso, a herd bull being utilized in the J.D. Hudgins herd. To complete the genetic strengths of 462/8 is his outstanding performance profile that charts positive for 7 traits and in the Top 5% of the breed for 5 traits. As confirmed by his pedigree, Brandon is producing outstanding and siring growth, heavy muscled offspring. Mr. V8 454/7 is one of our favorites due to his picture perfect phenotype. 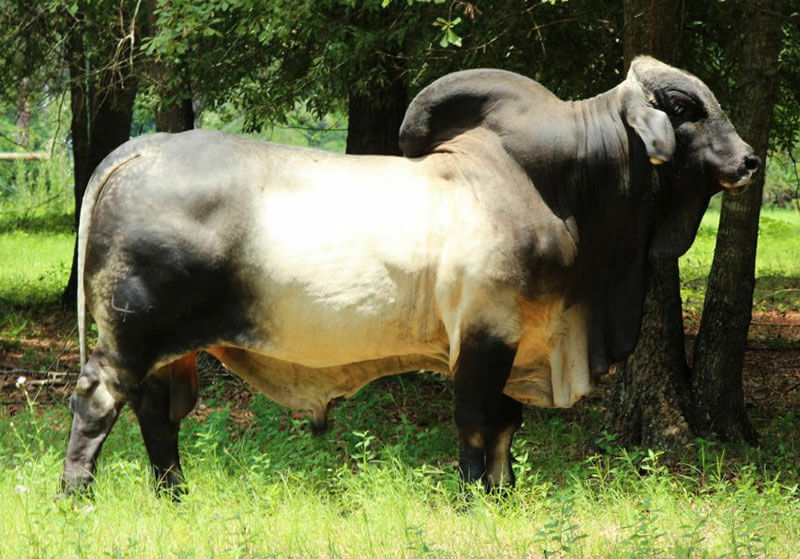 He is a larger framed bull that is big boned, deep ribbed, heavy muscled, extremely long and level. 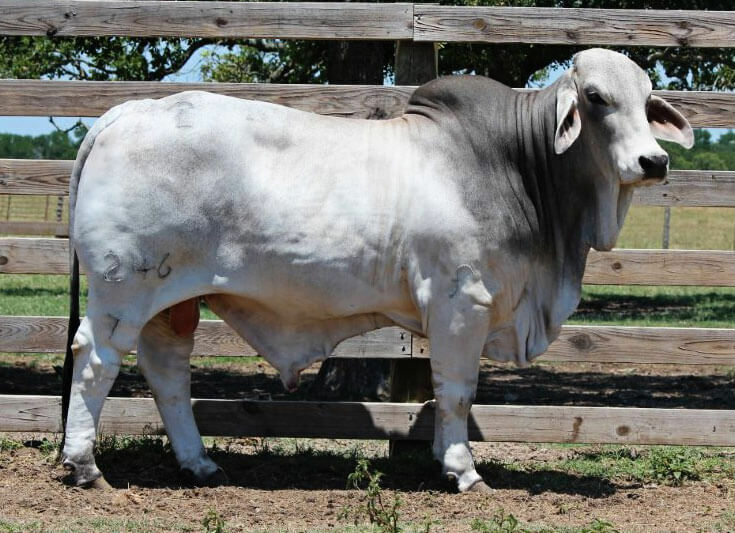 In addition to his great eye appeal, he offers the second most performance (behind his paternal half-brother V8 140/7) of our current bull battery ranking in the top 1/3 of the breed for 8 traits including growth and carcass. 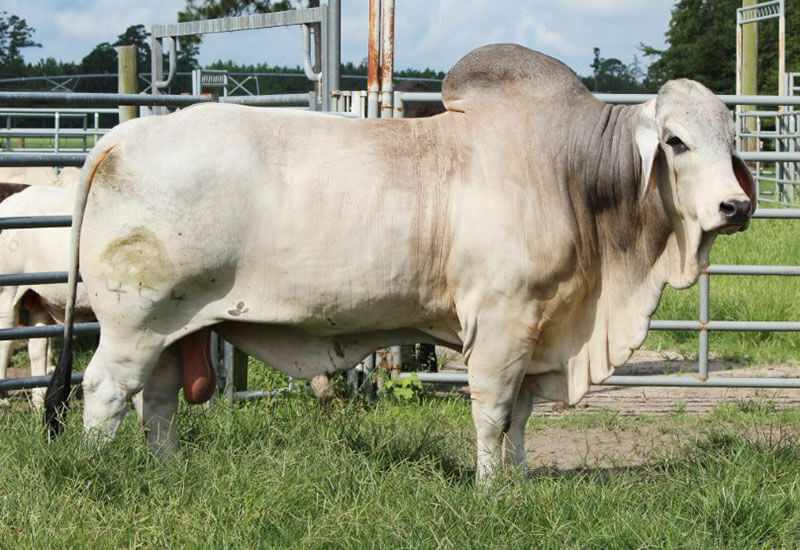 The most discriminating Brahman breeder will realize that 454/7’s pedigree is one of the most proven and desirable in the breed. His pedigree consists of the signature cross for V8 Ranch breeding +Mr. V8 380/6 to a daughter of the Register of Renown +JDH Sir Avery Manso. +Mr. V8 380/6 is known worldwide for his superior production of both show ring winners and performance oriented cattle. The dam to Mr. V8 454/7 is Miss V8 30/7 who is a former Reserve National & Reserve International Division Winner. Miss V8 30/7 is a daughter of +Miss V8 38/6 who was a National Champion and in the first calf crop of the iconic +Mr. V8 287/5 “Superstroke” and out of the 1997 International Champion +Miss V8 73/5. As you might expect from his pedigree, that combines some of the most influential genetics of V8 Ranch, and his breed leading performance his first calves are some of the higher performing, more impressive calves of the group. 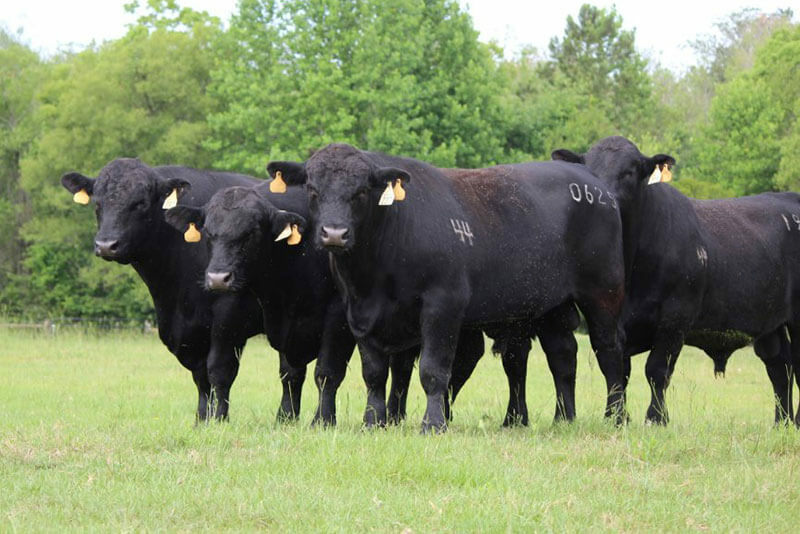 The more that you learn about our cattle, the more that you will realize that we try to buy genetics that combine the most proven genetics from some of the most proven programs in the world. Mr. V8 450/7 certainly meets this criteria based on his appearance, his performance and most importantly his pedigree. 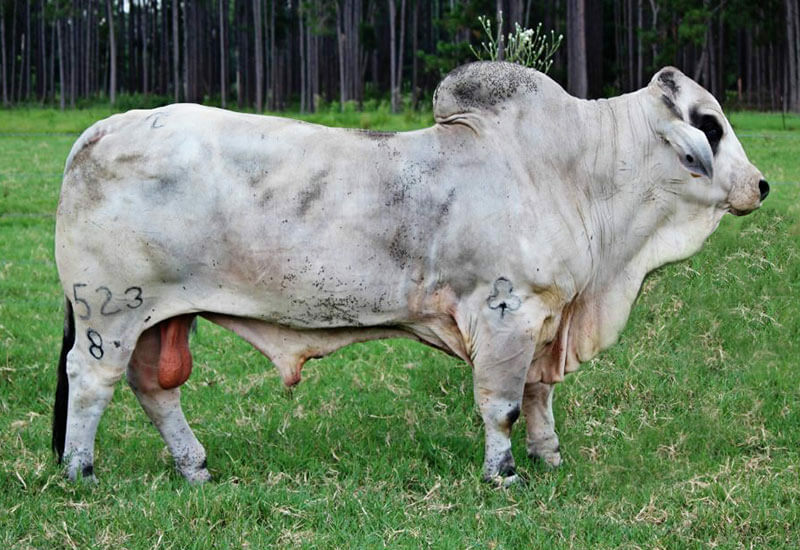 We initially purchased this bull because we thought that he most closely resembled his sire +Mr. V8 380/6 of any bull that we had seen. 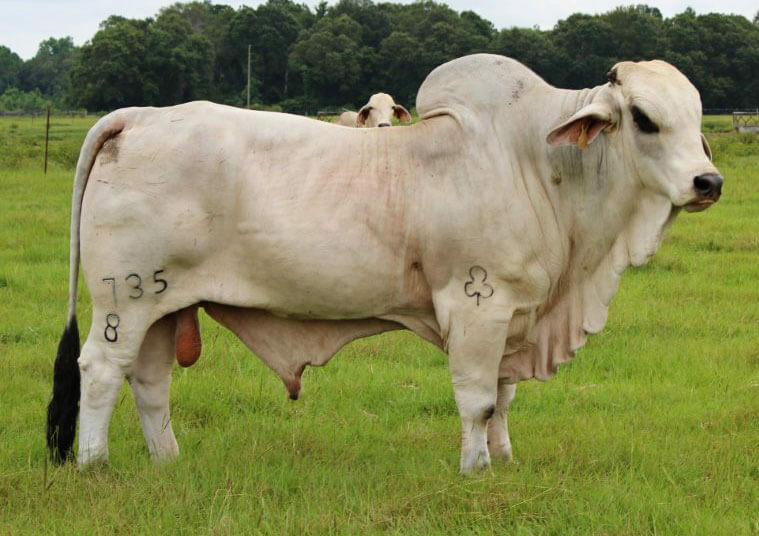 No one can dispute the role that 380/6 has played in the global beef industry. The more we evaluated this opportunity, the more that we realized that there was much more to this package. His performance is as good as any in the breed charting positive for every trait and ranking in the Top 10% of the breed for the economically relevant traits of WW, YW, Marbling & Ribeye Area. To complete this package is his outstanding pedigree. Not only is his top side the breed great +Mr. V8 380/6 but his dam is Miss V8 208/6 who is also the dam of Mr. V8 442/6 the many time champion and leading herd sire for V8 Ranch and others. Miss V8 208/6 also comes from one of the most influential cow lines at V8 Ranch with +Miss V8 188/5 who produced 2 International Champions and of course the foundation female, +Claydesta 807U5 who produced 70 offspring in ABBA that generated more than $500,000. Of all of our sires, we think that 450/7 might offer as much versatility as any and we look forward to the impact that he will play in our program. JDH Sir Remi Manso 886/8 is one of our newer additions to the herd. We have learned that when opportunities present themselves you better take advantage of them and that is just what we did in the Fall of 2016 when this top prospect was offered for sale. 886/8 spent his life at the J.D. Hudgins Show Barn but due to him being “too small” he never got the nod to hit the ring. That’s fine with us! We like his size and think that it only adds to our program as we would expect that he should produce early maturing offspring that are easy fleshing, super sound, deep ribbed and heavy muscled just as he is. 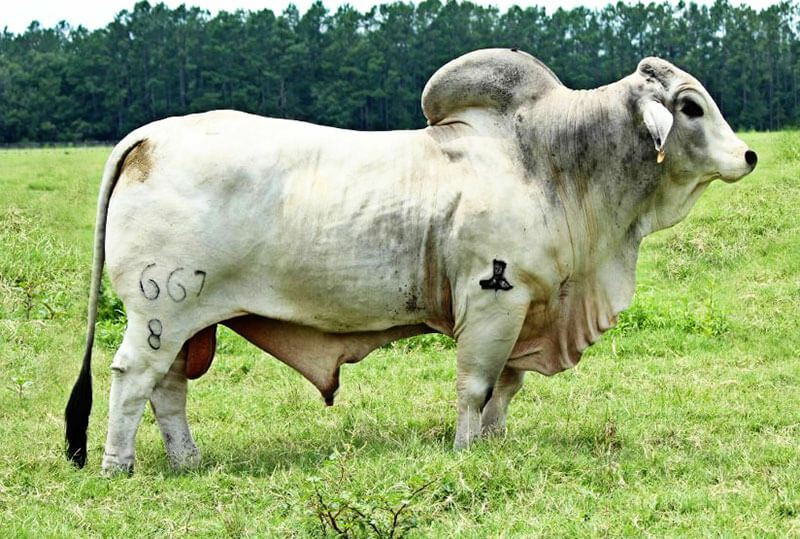 886/8 is sired by JDH Domino Manso 200/8 who was named the 2012 National Reserve Grand Champion Bull. The mother of 886/8 is a top embryo donor for J.D. Hudgins-Hudgins Division and sired by (=) JDH Josiah Manso 125/7, a former champion bull and an outcross to many of today’s popular sires. To meet our third criteria of having a proven performance profile he charts positive for 10 traits. We are excited to be able to utilize this young sire that combines some of the most influential genetics of J.D. Hudgins with breed legends such as +Woodson, (+)Remington, (=) Josiah and +Lawford. JDH Mr. Sandler Manso 667/8 was one of the first sires that we selected from J.D. Hudgins and he has proven to be a foundation sire in our herd. Not only is he built right being moderate framed, deep ribbed, level made, super thick and big boned but is backed by one of the most fertile pedigrees of the historic J.D. Hudgins Ranch. He is sired by JDH Sir Kenny Manso that has been used with much success. Kenny is sired by the Vanguard Sire and International Champion (+) JDH Mr. Woodman Manso. Woodman has been one of the most successfully used sires around the world producing countless champions including his most famous son +JDH Woodson De Manso the National & International Champion. Equally as significant is the paternal grand dam to 667/8, JDH Lady Regal Manso, who represents one of the strongest cow families of J.D. Hudgins having produced 54 progeny with 4 of them being herd sires for the ranch. The dam to 667/8 is extremely fertile having calved before 3 years old and having 9 straight calves. JDH Lady Cecille Manso is also the grand dam to JDH Sir Linus Manso 757/8 that anchored the 2017 show string with champion wins in Ft. Worth and the Kick Off Classic. JDH Mr. Sandler Manso 667/8 not only combines a proven breed leading pedigree but is low birth weight and moderate in his growth numbers helping produce offspring that will fit all sectors of the industry. JDH Stormy Manso was our pick of the J.D. Hudgins-J. Forgason Division bulls due to his ideal build, outcross pedigree, and breed leading performance. His sire is JDH Mr. Manso 489/6 that Mark Forgason is using extensively and retaining a large number of females. 489/6 is a young outcross sire that is the result of crossing two of the most proven maternal sires in the breed, JDH Pecos Manso & JDH Felcman Manso. 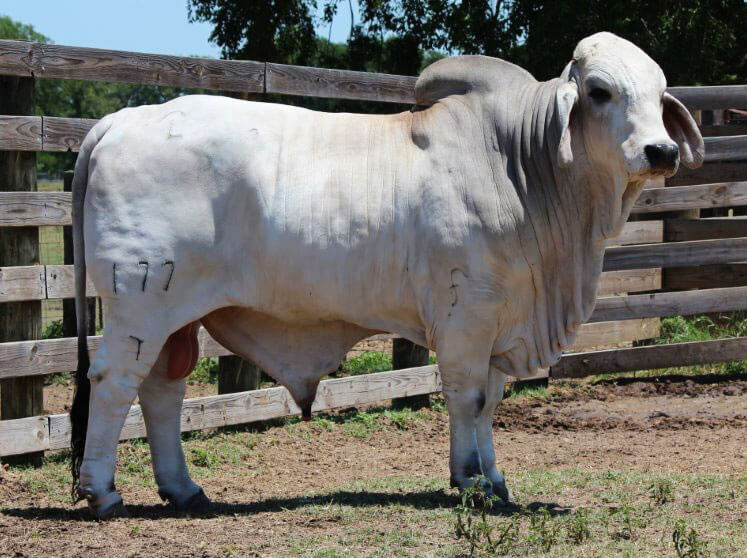 The dam to 177/7 again incorporates proven maternal genetics being sired by the Maternal Performance Sire (=)JDH Josiah Manso and out of a daughter of JDH Ranger Manso. JDH Stormy Manso 177/7 ranks in the top 1% of the breed for WW & YW and 15% for Milk. With our extensive herd battery that is built around the most popular bloodlines in the breed complimented with the maternal influence in 177/7’s pedigree and his superior performance we expect this young sire to play a major role in our herd for years to come. JDH Mr. Evans Manso 246/7 is a young sire that we are extremely excited about. He is sired by JDH Massai Manso that is producing so well for J.D. Hudgins-J. Forgason Division and Brett Nobbs of Australia. To add to this popular sire line is 246/7’s proven dam who is one of the most fertile females for J. Foragson Division calving before her third birthday and each year after that. To compete this outstanding package that combines one of the most popular sire lines and a proven dam JDH Mr. Evans ranks in the top 10% of the breed for WW, 15% for YW, 3% for Milk and 10% for REA. We look forward to the impact that this sire will play in our herd and with his versatility he should be one that will have a major influence. When we first started assembling our herd Mr. V8 518/7 was in the group of sires that we purchased. It was his style and muscle that drew us to him but it has been his production and proven pedigree that has made him a mainstay. Mr. V8 518/7 is sired by Mr. V8 51/6 the first natural calf by the polled matriarch of V8 Ranch Miss V8 98/6 who is also the basis of the cow family that produced the popular sire Mr. V8 458/7 “Noble”. Although the top side of this pedigree is extremely impressive it is the dam side that is really production oriented combining +JDH Charley’s Jazz with Miss V8 402/5 who has been an outstanding producer for V8 Ranch with 33 progeny registered in ABBA. We really like the genetics and predictability that Mr. V8 518/7 injects into our herd with +Mr. V8 287/5 “Superstroke”, +Mr. V8 901/4, +JDH Charley’s Jazz, (+)JDH Copano Manso and +Miss V8 617/2. To further compliment this elite pedigree 518/7 ranks in the top 15% of the breed for WW & YW as well as the top 25% for milk only making him more valuable in producing superior offspring to fit all sectors of the industry. JDH Gin Manso is sired by the National & International Champion but more importantly the proven producer of winners and breed influencers around the world, +JDH Woodson De Manso 206/7. The dam to 735/8 is a daughter of the Vanguard Sire (+)JDH Lawford Manso who has been used successfully around the world and produced 25 herd sires for J.D. 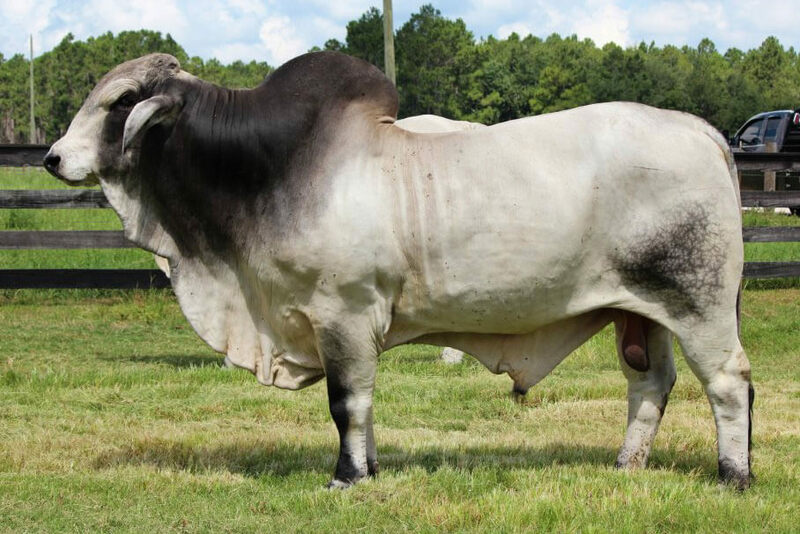 Hudgins, Inc. As a result of his production oriented pedigree JDH Gin Manso ranks in the top 4% of the breed for WW, 5% for YW, 10% for Milk, 15% for Marbling and 10% for REA. With a sire like this with such a breed leading pedigree and incredible performance we can rapidly make progress by producing offspring to add back into our program but more importantly to market to our customers to impact their programs. We think JDH Sir Kaplan Manso 923/8 could be the sire to take our program to the next level. To start, he is a son of the International Champion and top producing JDH Clanton De Manso 313/8. We really like Clanton due to his build but more importantly his production. The dam to JDH Sir Kaplan is a daughter of the International Champion JDH Denton De Manso and out of a daughter of the National & International Champion +JDH Woodson De Manso 206/7 making 923/8 double bred Woodson. Those that know our program realize that we don’t show cattle but we do still understand the importance of popular bloodlines especially when they combine a performance profile that ranks in the top 1% of the breed for WW, YW & Milk and then top 10% for both Marbling & REA. You simply can’t put together a better package than JDH Sir Kaplan Manso 923/8 and we are extremely excited to see his first calves! 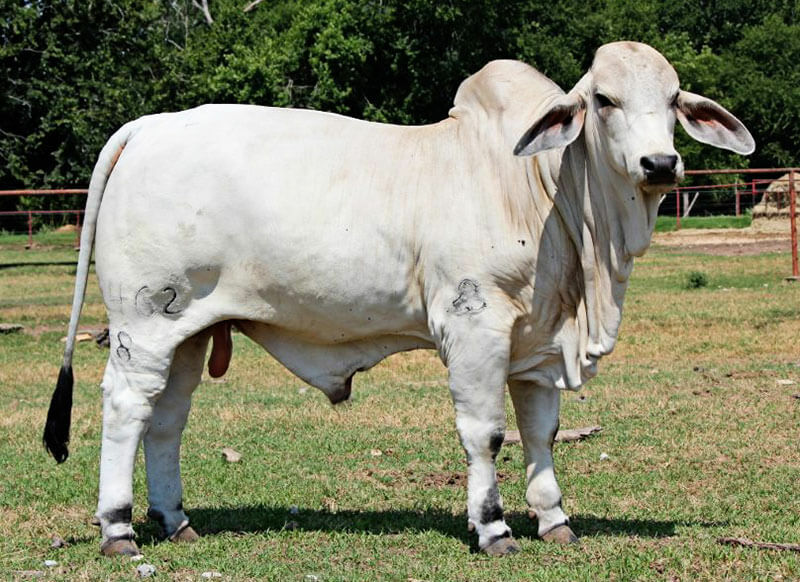 This young sire combines one of the most proven pedigrees in the Brahman breed. When you study his pedigree you rapidly recognize that he is sired by the Vanguard Sire, International Champion and global icon (+)JDH Sir Liberty Manso 847/5. The dam to JDH Sir Iago is a super dam having a calf every year with one daughter being retained in the J.D. Hudgins Herd and a son, JDH Clive Manso, being sold to Kyle Smith & Al Mast to headline their herds. As you might expect as a result of such superior genetics 998/8 ranks in the top 2% of the breed for WW, 3% for YW, 20% for Milk, 5% for Marbling and 3% for REA. JDH Sir Iago will play a major role in our program by producing cattle that will hit all of the production goals! These two young full brothers will play a role in the next chapter of Circle F Farm’s success. We have been a huge fan of Mr. V8 458/7 “Noble”, the sire of these two calves, since we first saw him as a calf. We went to V8 specifically to buy a son of “Noble” due to us liking him but more importantly after seeing his first calves and the interest that they created. When we went to look we couldn’t pick one over the other as they offer something different so we purchased both and will likely breed them side by side. Most would accept owning a son of Mr. V8 458/7 as enough but we wanted to ensure that we maximized our purchase and got a son of one of the V8 leading donors. The dam to these two young sires is Miss V8 829/6 who is the dam to the V8 Herd Sire Mr. V8 660/7 along with 29 other registered calves. 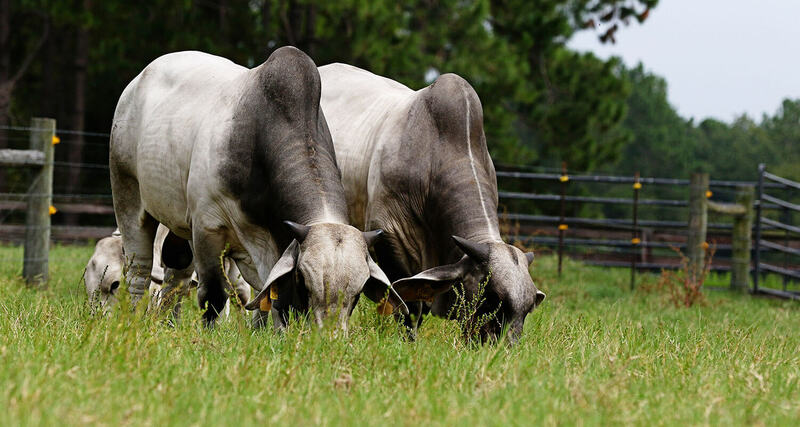 As you might expect, these two young bulls will inject some of the most proven cow families and leading genetics in the Brahman breed into their offspring. Based on their pedigree and actual performance these two young sires boast a breed leading performance profile that ranks in the top 1% for WW & YW, 40% for Milk, 10% for REA and 1% for Docility. We will keep you posted on the progress of these two young sires but you can bet that you will be hearing a lot from them! We purchase our Hereford bulls from Jonny Harris at Greenview Farms. We like Jonny’s bulls due to his emphasis on fertility, milking ability, udder quality and superior genetics. Just as the other breeds we feel that we must use the most proven genetics in order to produce a superior product. 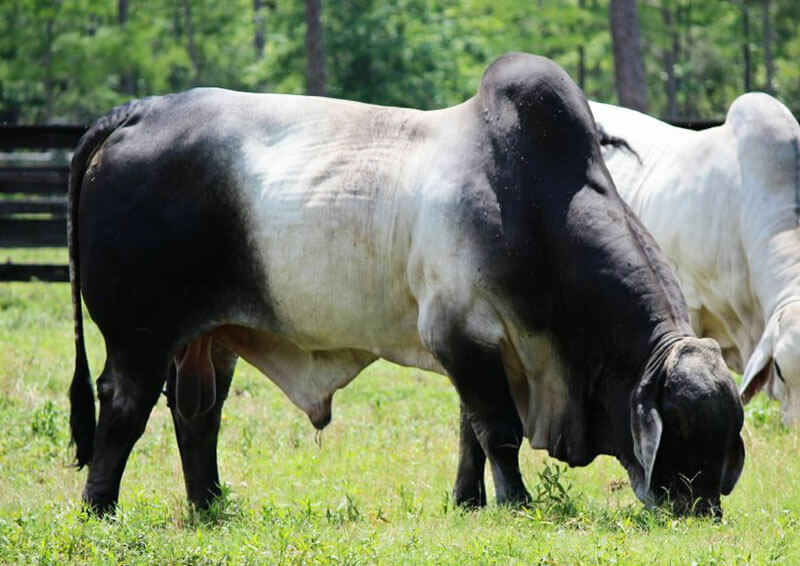 The Greenview bulls are raised in South Georgia, are hearty and are backed by a reputation program. Jonny is not only a top producer of Polled Herefords & F-1 Braford cattle, but a dear friend and a top cattleman who has helped us a lot along the way. 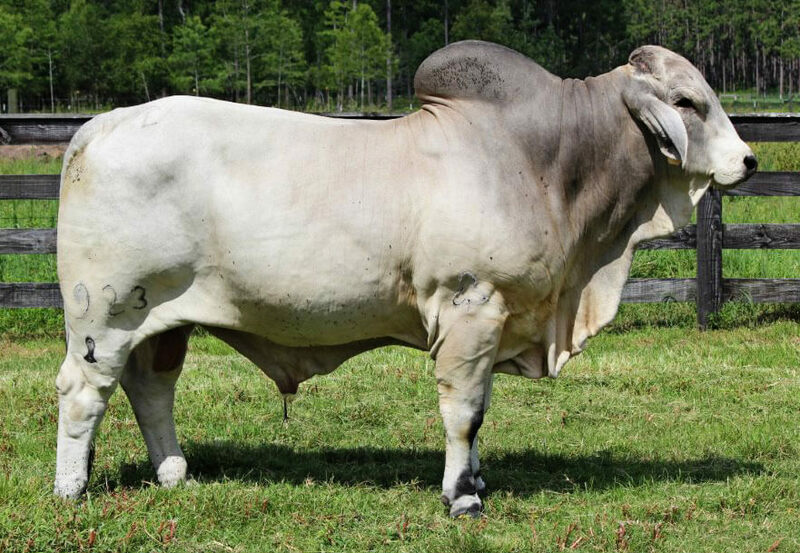 When we decided to diversify our F-1 Program and begin producing Angus x Brahman F-1 females we chose 44 Farms as our source. Our initial purchases were closely related to help ensure the consistency of our calves. Half of the bulls were sired by AAR Ten X 7008 and the other by a son of his VAR Discovery 2240. Ten X ranks in the Top 1% of the breed for Yearling Weight, Milk, Carcass Weight, Marbling, $F (Feedlot Value) and $B (Beef Value). Discovery was the hottest bull in the Angus breed for 2016 due to his combination of low birthweight, extreme grow and elite carcass traits. We feel that it is important to utilize the most elite genetics of the breeds that we purchase. In addition, it is even more important that the bulls are balanced in their performance profile to help ensure the success of their progeny in all segments of the industry.